Another choice that faces the self-builder is what type of heating to install into their new home. There are many types of home heating and the choice should be made knowledgeably as it will be in the home for many years. A modern clean and efficient way to heat your home without obtrusive pipes, radiators or fires on show. This system should ideally be put in place when the house is still empty. Water or electricity are the normal services used for this method of heating. Probably the most popular way of heating homes and the easiest system to use. Always employ a corgi registered engineer if installing a gas system and certified engineers for electric systems. There is not a more welcoming sight than a roaring open fire on a cold winter's day. Building a fireplace in your new home will make a feature of any room. Chimneys and flues will have to be cleaned regularly but apart from building the fire and storing coal or logs the maintenance of an open fore is minimal. For safety when there are children in the house fireguards should be used and children supervised. Stoves are trendy and practical. There has been an increase in popularity in recent years and consequently there are many designs on the market that come in both traditional and modern styles. There are sizes of stoves that suit small rooms and workshops or large open plan areas. These stoves can burn coal, logs or multi fuels. Many come with a hot plate on the top that will take a saucepan or kettle. It is now possible to purchase room heaters that look like flat screen televisions and are built flat against a wall. Many of these systems do not require outside flues and are ideally suited to a modern style of house. Furthermore they can be purchased relatively cheaply from larger Do-it-yourself stores. 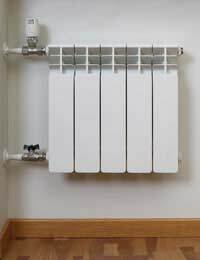 Having a reputation for inefficient heating the night storage heating system should still be considered as a heat source for your home. Designs and efficiency have been improved in recent years and could be just what you're looking for. An oil tank will have to be sited in your grounds and the oil tankers used to deliver the oil are quite large. Will your driveway have the right access for the tanker lorry to reach the storage tank? This will have to be considered during the planning stage of your home. If you are considering using coal as a heat source consider where it will be stored and how the deliveryman will access the storage areas. It is possible to have a cooker that is not only used for cooking but can heart the water and run a central heating system as well. These can be gas, oil, and electric or multi fuel burning depending on the requirements of the home. There will be times when your heating is not working due to power cuts or work being done on the property. Also it never hurts to have back up heating available so consider having a portable heater powered by oil, paraffin or Calor gas that can be moved around the home, shed or workshop to be used where it is most needed.